Celebrities sporting tattoos is nothing new. However, there's a recent trend that I've noticed of non-Jewish celebrities having Hebrew words and phrases tattooed on their bodies. Soccer superstar (and famous Spice Girl spouse) David Beckham's Hebrew tattoos are being displayed all over the Web today, but only because of the Hebrew tattoo's proximity to his tattoo getting all the attention. Beckham is an ambassador for “Sainsbury’s Active Kids” in Britain, where he's was born and raised. In that role, he recently appeared in a promotional poster for a program run by the Sainsbury supermarket chain that provides local schools with sporting equipment. It wasn't any of his Hebrew tattoos that caused the scandal, but rather the provocative image of his wife Victoria on his forearm. Apparently the local schools aren't so eager to display the posters of Becks showing off a naked image of his wife. Next to the tattoo in question is a line of Hebrew text from Song of Songs which reads "Ani l'dodi li va'ani lo haro'eh bashoshanim" - My beloved is mine and I am his, the shepherd [grazing his flock] among the lilies. 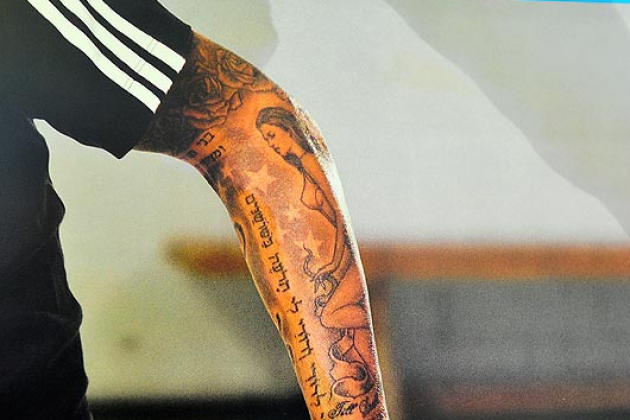 The tattooed verse from the Torah does not mean Beckham considers himself Jewish. He has a large tattooed cross on the back of his neck. The other Hebrew tattoo above the verse from Song of Songs is from the Book of Proverbs 3:1 and means "My son, do not forget my teaching but keep my commands in your heart." Beckham's wife Victoria (née Posh Spice) has the same quote from Song of Songs tattooed vertically from her neck to her back. This verse is often recited by bride's under the chuppah (wedding canopy) at a Jewish wedding to proclaim their love to their groom. Other non-Jewish celebs who have Hebrew tattoos include Christina Aguilera who has the same verse from Song of Songs as the Beckhams on her lower back and Madonna with the Hebrew letters lamed, alef, vav on her shoulder to represent a Kabbalistic name for God. Britney Spears has the letters mem, hey, shin tattooed on her which is another Kabbalistic name for God. Beckham's father was Jewish and I think he identifies as being Jewish. Although he plays in L.A., I don't recall any local shul noting his attendance at services. Then again, there are plenty of other Jews who do not show up, either. Victoria Bechham is not Jewish in any way, as far as I know. Madonna, well I assume you know her Kabbalah shtick. Should you communicate with Beckham, I would be delighted to have him daven at Temple Aliyah in Woodland Hills, CA. Tell him to call me; I think you might know my number. Although the tattoos may be beautiful, it is against the Jewish belief to purposefully scar your body, you can be denied the right to be buried in a Jewish cemetery unless you were a victim of the concentration camps in which case the scaring was not by choice. My grandfather had many tattoos that he had done while serving in the British Forces in WW2. He was buried in a jewish cemetery. But I'm not sure if they removed his tattoos before burial. Jews are not barred from being buried in a Jewish cemetery if they have been voluntarily tattooed - that is an old wives tale. Ask any rabbi. Tattoos are very popular in Israel among young Israelis.